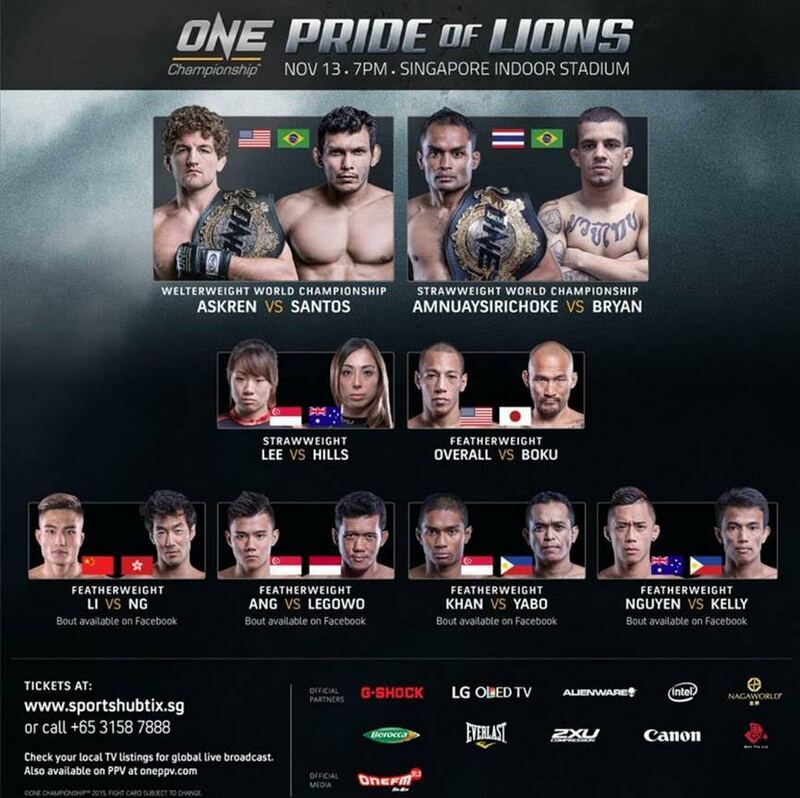 30 October 2015 – Singapore: The largest sports media property in Asian history, ONE Championship™ (ONE), has added five exciting new bouts to ONE: PRIDE OF LIONS which takes place on 13 November at the Singapore Indoor Stadium in Singapore. Aside from the highly-anticipated rematch between ONE Welterweight World Champion Ben Askren and challenger Luis Santos, Dejdamrong Sor Amnuaysirichoke will defend his ONE Strawweight World Championship against Yago Bryan of Brazil in the evening’s co-main event. The is ONE Championship’s 9th event in the Singapore Indoor Stadium and it is proudly presented with official partners Canon, LG, G-Shock, Alienware, Berocca, Everlast, Nagaworld and Mah Pte Ltd.
Tickets for ONE: PRIDE OF LIONS are available at S$749 for Cat 1, S$158 for Cat 2, S$58 for Cat 3, S$38 for Cat 4 and S$38 for Cat 5. Logon tohttp://www.sportshub.com.sg/sportshubtix/Pages/one-pride-of-lions.aspx for more information. Dejdamrong Sor Amnuaysirichoke, a former Lumpinee world champion, is undefeated as a professional mixed martial artist and is the reigning ONE Strawweight World Champion. He has decimated all opposition that has been placed in front of him and will look to continue his dominance beginning with his first title defense against Yago Bryan. Yago Bryan is a mixed martial artist from Rio de Janeiro, Brazil. An all-rounded fighter, Bryan will be looking to continue his winning ways when he steps inside the ONE Cage. He jumps straight into a world title fight as he takes on defending champion, Dejdamrong Sor Amnuaysirichoke in his ONE Championship debut. In addition, Alain “The Panther” Ngalani returns to the ONE Cage as he battles Igor Subora in a heavyweight bout that is sure to leave fans on the edge of their seats. Cameroonian Alain Ngalani is a powerful heavyweight kickboxer and Muay Thai champion. Fighting out Hong Kong, Ngalani is eager to return to the ONE Cage after a setback last year in his rematch against Chi Lewis Parry in ONE: WAR OF DRAGONS in Taiwan sent him back to the drawing board. Ngalani will take on Igor Subora in what should be a powerful matchup. Igor Subora of the Ukraine trains all across Asia, particularly in the Philippines. He is a former champion in another promotion and boasts a solid skillset which consists of technical striking and hard-nosed grappling. Subora is one of the most talented big men on the ONE Championship roster, but he’ll have his hands full against the strength of Alain Ngalani, who he takes on next. Last month, Martin Nguyen fell short of the interim ONE Featherweight World Championship to Marat Gafurov. The loss provided lots of learning for the talented 26-year old from Sydney, Australia, and has also equipped him with a lot of valuable experience. Nguyen is itching to get back inside the ONE Cage as soon as possible to resume his promising career. Standing in his way is Filipino featherweight Edward Kelly. Edward Kelly is a product of Team Lakay and has trained with world-class talents in the high altitudes of Baguio City. Kelly is armed with both striking and grappling as part of his wide range of abilities. After defeating Jimmy Yabo by submission in his last fight, he will look to replicate his success against another solid opponent in Martin Nguyen. Benedict Ang made a successful ONE Championship and professional MMA debut in his last outing, defeating Waqar Umar by decision. The 19-year old Ang has proven his mettle in three rounds of intense action and will now look to continue his young career against Yohan Mulia Legowo of Indonesia. Yohan Mulia Legowo is one of Indonesia’s most talented mixed martial arts veterans. With a record of seven wins against only three losses, Legowo seeks his first victory inside the ONE Cage. He will take on Singapore’s Benedict Ang, a fighter 16 years his junior, in a bantamweight bout that is sure to produce fireworks. Kicking things off for ONE: PRIDE OF LIONS will be two featherweight prospects. Winner of ONE: DYNASTY OF CHAMPIONS Featherweight Tournament, China’s Li Kai Wen has enjoyed two victories so far inside the ONE Cage. He now looks for victory number three against Hong Kong’s Nathan Ng, who was also victorious in his ONE Championship debut.